Are you interested in prehistoric archaeology, ancestors and geology? Thanks mainly to the vision and forward-thinking of bodies such as Historic Scotland, many of the over 100,000 sites of archaeological interest scattered across Scotland can be accessed by the public. See the Scottish government site for all ancient and scheduled monuments records. Thanks mainly to the vision and forward-thinking of bodies such as Historic Scotland, many of the over 100,000 sites of archaeological interest scattered across Scotland can be accessed by the public. And with a dedicated Scottish Archaeology Month (Dig it!) seeing over 200 organised events, talks and tours all over the country, you quickly realise that Scotland is the place to be to catch up on the past! Scotland is unique in that as well as the many famous historic sites, from Edinburgh Castle to Antonine's Wall, and Glasgow Cathedral to the Forth Road Bridge, there are also many pre-historic and Neolithic sites to visit. Pictish stones are found throughout Scotland and their symbols are still not fully understood - most are now in local museums but a few stones are still on their original sites and are well worth a visit. Regardless of where you are holidaying or staying in Scotland, you can be guaranteed you won't be far from an archaeological location of interest, whether it's an ancient site, structure, building or relating to Scotland's maritime and industrial heritage. You can check out any local sites of interest by visiting canmore.org.uk where there is a searchable database of over 320,000 records covering 1.3 million catalogue entries. 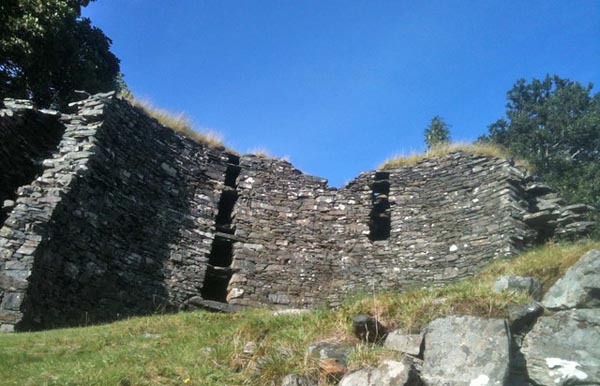 Dun Trodden and Dun Telve - 2,000-year-old tall pair of Brochs - 500m apart just south of Glenelg on West coast Scotland. The Calanais Standing Stones which are located on the west coast of Lewis (in the Outer Hebrides) are one of Scotland's most impressive and best-preserved Neolithic monuments, said to be second in importance only to Stonehenge. They played a very important part in ritual activity during the Bronze Age. Mainland Orkney in the north east of Scotland has, amongst its many ancient discoveries, two very significant ancient sites, the Standing Stones of Stenness and Skara Brae (uncovered by a horrendous storm some 150 years ago! ), the former containing what many archaeologists consider to be the best megalithic burial tomb in the UK, the latter containing the remarkable subterranean remains of a compact village some 5,000 years old. There is also the Ness of Brodgar which dates back to 3,200BC. There are also some fine examples of sites hidden away in Scotland's forests that truly reflect upon the way ancient peoples used to live. Worth a mention is the Knock Farril Pictish hill fort located in Blackmuir Wood near Strathpeffer (a village and spa town in Ross and Cromarty in the Highlands). What makes this site interesting is the stunning location combined with it being one of the first archaeological digs in Scotland. Cup and Ring marking in Galloway - mysterious symbols carved into bedrock. There are other forestry-located sites scattered around Scotland, including the Whitehill recumbent stone circle, in Pitfichie near Aberdeen, the Ormaig Neolithic cup-and-ring marked rock art in West Argyll, the Craig Phadrig hill fort near Inverness and the hauntingly beautiful Aoineadh Mor township, near Fort William, only uncovered as late at the mid 1990s. One of Scotland's largest landowners, the National Trust for Scotland, curates some 10,000 archaeological sites and features (over 100 of them are Scheduled Ancient Monuments or 'nationally important' archaeological sites or buildings that are of such importance they have been given protection against unauthorised change). Many of the National Trust sites feature visitor centres and organised trails and tours to follow which you can plan around to make a more formal visit. So for anyone interested in ancient history, you are never far away from one of the many archaeological sites of interest in Scotland. Some you can just find by chance if you're out walking such as a standing stone in the middle of a field or you might spot a cup and ring marking whilst you're having a picnic. Scotland's past, whether megalithic or more recent, is to be found all over the country and exploring it whilst on holiday here will enhance your visit! Discover Scotland's Sacred and Religious Sites - ancient castles and Standing Stones.